A Grain of Sand believes that strong campaigning is vital to delivering positive change in our world. From general election campaigns through to corporate advertising campaigns, massive resources are used to try to persuade the general public to make decisions. A Grain of Sand has over 22 years of proven campaigning experience that can be shared. By looking back at the key tools of campaigning success over those 10 years that helped deliver a £5.5 billion spend on the clean up of the UK coast, A Grain of Sand can help advise on everything from running a small local campaign through to far larger challenges facing us all. Campaigning workshops are an ideal way of starting this process and can be specifically designed and adapted to varying needs. We can also help with helping to develop and plan a campaign and give continual advice. A Grain of Sand works with a number of associates and companies, drawing in skills and resources as required. “Chris’s proven track record in campaigning and branding, coupled with an unconventional approach and great personal dynamism were invaluable to Angling Trust in shaking up our ideas so that they fizzed.” Mark Lloyd, Chief Exec. Angling Trust following a Campaigning Master Class. “His (Chris Hines) media savvy was notorious and SAS was soon almost as widely known as Greenpeace and Friends of the Earth. But beyond its famous stunts with wetsuits and gas masks, SAS became one of the most effective environmental campaign groups in the UK thanks to Hines’ total command of his brief, his dedication to common sense and decency… Thanks to Hines’ surf based vision, a cleaner, greener future actually looks possible.” Surfers Path on the Green Wave Award. 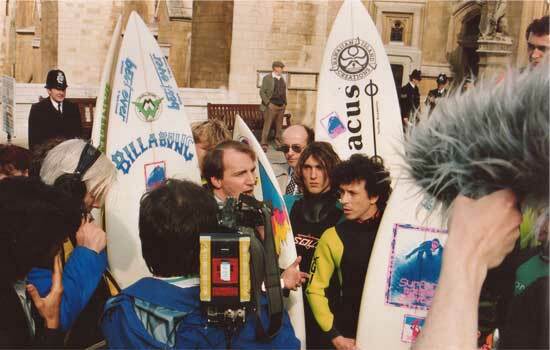 “The campaign never stopped for Hines and he continued to ride roughshod over the rules, doing groundbreaking work that gained respect from fellow campaigners, top lawyers, journalists and political parties.” Carve Magazine. 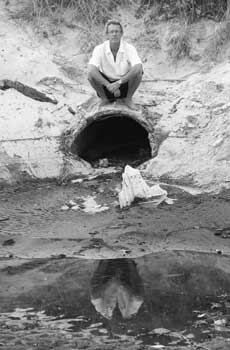 Above left: Chris Hines at a Combined Storm Overflow pipe, Mermaid Beach, Australia. SAS currently campaign hard on CSOs. Photo: Swilly. Above right: Chris Hines, SAS lobby of the House of Commons 1991.